The number of people affected by scorpion stings has soared from 37,000 in 2007 to 126,000 in 2017. 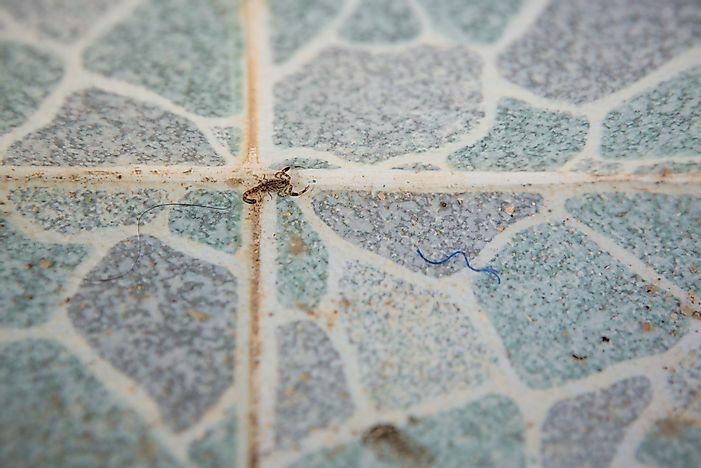 A small scorpion in a floor tile. As urban sprawl continues in Brazil, more pests have been making their way into homes. Photo credit: Shutterstock.com. Bad news, arachnophobes: your chances of being victim of a scorpion bite are on the rise. That's true at least if you live in Brazil, where what used to be a relatively rare occurrence is becoming more commonplace. In recent years, the country has experienced a notable increase in the number of deaths caused by scorpion stings. One of the most recent examples tragically occurred last week in Sao Paulo when a four-year-old girl died following a scorpion bite. The little girl was taken to the local hospital only to find that they did not have the anti-venom required to save her life. People who are at a higher risk of death from scorpion bites include the young, the elderly, and those with allergies to insect bites. Statistics indicate that reported deaths resulting from scorpion bites in Brazil have increased by over 160% from 2013-2017. While there were 37,000 reported scorpion stings in 2007, 2017 reported 126,000 stings. Scorpions, which are among the world’s most resilient animals, are tenacious even when sharing their space with humans. Not only are scorpions parthenogenetic, which means the females can breed without the males, but scorpions can survive for months without food due to their extremely low rates of metabolism. As to why scorpion bites are becoming a more common occurrence, experts point the finger at urban sprawl. Like many other creatures, scorpions have had their living spaces encroached upon by humans, which has required the species to adapt in interesting ways. For instance, some scorpion species like the yellow scorpion, now inhabit urban garbage heaps, drains, and sewers where they can easily feed on their favorite meal - cockroaches. If one finds themselves in Brazil or any other place infested with scorpions, some precautionary measures can be taken. First, shake out beddings, towels, shoes, and towels before using them. Secondly, sleep under a mosquito net. Anyone who gets a scorpion sting should seek immediate medical attention.